Protect smaller pages and safely show them off with Avery® Mini Heavyweight Sheet Protectors. These 5.5 x 8.5 top-load sheet protectors will safeguard your important documents while the durable heavyweight material offers sturdy protection for frequent use. The diamond clear finish delivers a crisp view when displaying important documents. Protect smaller pages and safely show them off with Avery® Mini Heavyweight Sheet Protectors. 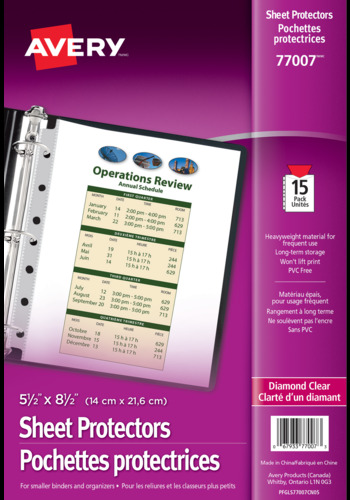 These 5.5 x 8.5 top-load sheet protectors will safeguard your important documents. The durable heavyweight material offers sturdy protection for frequent use while the diamond clear finish delivers a crisp view when displaying important documents. Nonstick sheet protectors are made from polypropylene and are PVC-free, acid-free, and archival-safe. Avery® sheet protectors deliver lasting protection for your important documents. Use with mini binders and organizers. Thick heavyweight sheet protectors are strong enough to protect documents from spills and tears and durable enough to stand up to frequent use in a three-ring binder. The Diamond Clear finish offers a polished look and crisp view of your documents.